105. Pholiota flammans (Fr.) Kummer, Der Führer in die Pilzkunde p. 84. 1871. Agaricus flammans Fries, Syst. Myc. 1: 244. 1821. Hypodendrum flammans (Fr.) Murrill, Mycologia 4: 261. 1912. Pholiota kauffmaniana Smith. Mycologia 36: 254. 1944. Illustrations: Text figs. 211-213; Pl. 47. Pileus (3) 4-8 (10) cm broad, obtusely conic becoming broadly umbonate, at times the umbo obsolete, surface viscid beneath a covering of recurved fibrillose scales, glabrescent at times in age, the margin often fringed with veil remnants as a thin sheet or in patches, color a brilliant yellow ("picric-yellow") over all including the veil remnants, at times "lemon-chrome" to "deep-chrome" or "raw-sienna," disc at times tawny in age. Context firm, pliant, thick, yellow and with a greenish yellow line next to the gills; odor and taste mild. Lamellae sharply adnexed, "picric-yellow," staining dingy brown along the edges when rubbed, close to crowded, 3 tiers of lamellulae, moderately broad to broad in age, edges even. Stipe (3) 5-10 (12) cm long, (3) 5-10 mm thick, equal or slightly enlarged at base, solid, stuffed to tubular, concolorous with pileus inside and out, darkening to cadmium yellow at base, covered up to the annulus with a dense coating of recurved yellow scales from the ruptured veil, silky fibrillose above the annulus. Veil forming an evanescent, superior zone of bright yellow fibrils or submembranous. Spores 4-5 x 2.5-3 µ smooth, ochraceous in KOH and about the same color in Melzer's reagent, oblong to ellipsoid, smooth, wall thin, apical pore not evident. Basidia 18-22 x 3.5-4.5 µ, narrowly clavate, 4-spored, hyaline in KOH, yellowish in Melzer's reagent. Pleurocystidia of two types; 1) 25 -35 x 6-8 µ, clavate to mucronate and with a dark flavous homogeneous content as revived in KOH, in Melzer's reagent yellowish, walls smooth thin and hyaline; 2) chrysocystidia 26-40 x 6-9 µ fusoid ventricose to clavate-mucronate, content amorphous and granular-aggregated to forming folded (reticulate) masses cinnabar-color to orange-brown in Melzer's reagent. (Cheilocystidia as in type 1 of pleurocystidia or small and cylindric (18-20 x 3 µ), the former abundant. Caulocystidia present only as filamentose end-cells of surface hyphae. Gill trama of floccose subparallel hypha 4-8 µ broad, ochraceous in KOH and pigment diffusing into mount, masses of needle-like crystals forming in the mount; cell walls thin, smooth, yellowish; subhymenium of narrow hyaline somewhat interwoven gelatinous hyphae. Pileus cutis a thick layer (100 µ ±) of narrow (2-4 µ) gelatinous hyphae yellowish in KOH; hypodermial region of ochraceous-brown hyphae, structurally continuous with context, the hyphae compactly interwoven, 4-12 µ diam., walls smooth thin and ochraceous to hyaline; oleiferous hyphae present. Clamp connections present. All hyphae inamyloid. Habit, Habitat, and Distribution: On conifer logs and stumps, Maine, Michigan, Tennessee, North Carolina, Idaho, and Washington; August-October. Observations: Kauffman, when collecting in the Olympic Mountains of Washington in 1925 described viscid specimens as a tentative new species. 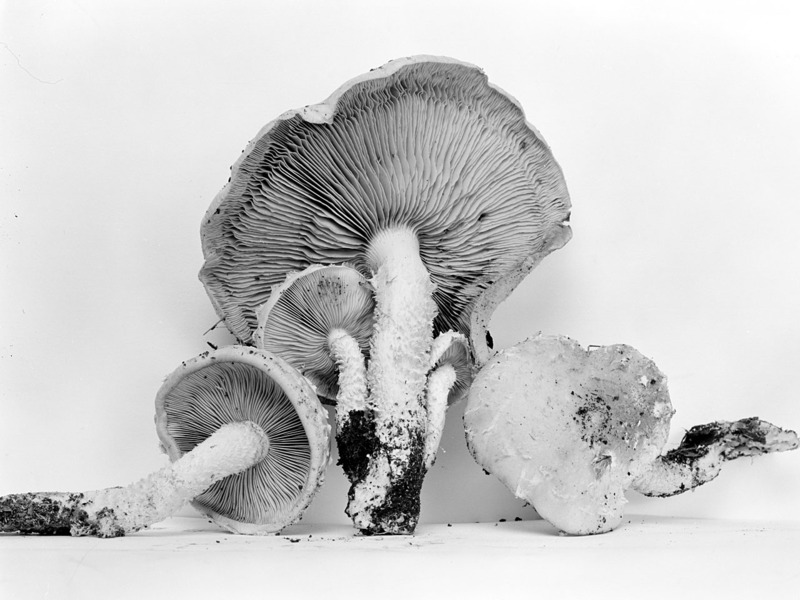 When Smith was working in the same area he found the same variation in the same condition and since a viscid as contrasted to a non-viscid pileus was an important feature in Pholiota he described the viscid variant naming it in honor of Kauffman. However, anatomical studies of this variant in comparison with material collected by Kauffman in Sweden and presumably checked by Romell, and material sent to Smith from France by Josserand are all so much alike microscopically that there appears to be no clear line of separation-particularly as applied to the pileus cutis. In addition, during the last twenty years Smith has observed the species in many areas of the United States and under variable weather conditions. He is now convinced that the problem is one of a pileus cutis which is of such a chemical composition that the hyphal walls slowly become subgelatinous in a highly humid atmosphere or from continuous rain, and that along the west coast these conditions are realized so regularly that we have a viscid variant of P. flammans in that area. During dry seasons, of course, the character will not show in the field, but is often very evident under a microscope where cuticular gelatinization in KOH is very distinct. In this respect this fungus is different from most species in the genus. When one encounters a gelatinizing cutis in this genus the hyphae are usually distinctly narrower than those of the context. This is not so clear as the two areas intergrade. The gelatinous subhymenium of P. kauffmaniana might seem to distinguish the latter from P. flammans but here again we are dealing with a character not often evident until maturity in Pholiota, and one found fairly inconstant in Galerina (Smith & Singer, 1964). Hence, we hesitate to place much emphasis on it here in particular since this feature is evident on the specimens from Josserand. The microscopic data on his specimen are identical with those of Smith 236 from New York which was used for our description. The chrysocystidia color typically in Melzer's, the gelatinous pellicle is thick and of hyphae narrower than those of the adjacent pileus context, the subhymenium is at least subgelatinous and the needle-like crystals form in KOH. The spores deposited on the cap average slightly larger (0.5 µ ±) than in Smith 236 and the clavate pleurocystidia are slightly more orange in KOH. We do not regard the last two features mentioned as important taxonomically. The description of P. flammuloides Moser does not clarify the situation. The outstanding features of this species are the thick pellicle of narrow gelatinous hyphae in sections revived in KOH, the chrysocystidia with content orange-brown to red in Melzer's reagent, the abundant more or less clavate pleurocystidia with homogeneous ochraceous content in KOH, the needle-like crystals often aggregated to a dendroid pattern which form in KOH mounts, and in the orange to yellow pigment diffusing in mounts of this medium. On anatomical grounds the species must be placed in the viscid group of subg. Pholiota. Material Examined: COLORADO: Kauffman 9-9-20; IDAHO: Smith 46285, 46833, 47020, 60222; MAINE: Bigelow 4546 (MICH); MICHIGAN: Bartelli 2110 (MICH); Harding 380, 37063, 38071; NEW YORK: Kauffman 9-15-14, 9-17-14; Smith 236; NORTH CAROLINA: Hesler 23386 (TENN); OREGON: Smith 19189, 20042, 24202, 26970, 27771; TENNESSEE: Hesler 10868, 21001 (GSMNP); Kauffman 9-16-16, 9-21-16, 9-20-16; Smith 10868; WASHINGTON: Kauffman 9-13-15, 10 -23-15, 10-13-25, 10-31-25, 11-5-25; Smith 3167, 16161, 16186, 16268, (type, P. kauffmaniana), 16339, 16549, 16854, 17317, 17342, 31113.